MANILA, Philippines - Results are out! 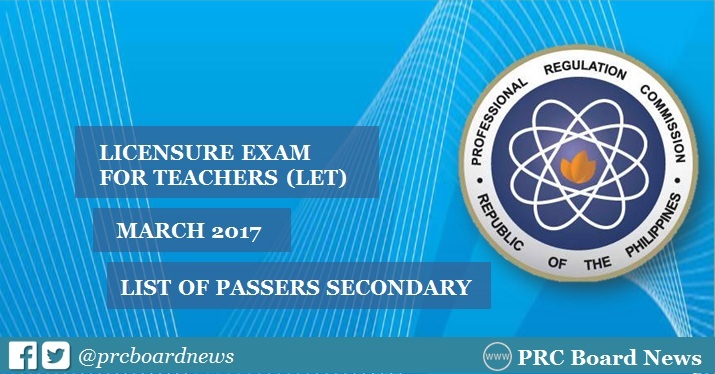 The Professional Regulation Commission (PRC) and the Board for Professional Teachers (BPT) announced on Monday, May 22, that 18,482 secondary teachers out of 72,584 examinees (25.46%) successfully passed the Licensure Examination for Teachers (LET) given last March 26, 2017 in 18 testing centers all over the Philippines. It is further announced that 10,804 passers are first timers and 7,678 are repeaters. The passing rate for March 2017 LET secondary level is among the lowest in history. In the past years, passing rate is usually on the range of 28-40%. The BPT who gave the LET board exam is composed of Dr. Rosita L. Navarro, Chairman; Dr. Paz I. Lucido, Vice Chairman; Dr. Paraluman R. Giron and Dr. Nora M. Uy, Members. From May 31 to June 16, 2017(Secondary), registration for the issuance of Professional Identification Card (ID) and Certificate of Registration will be done on-line. 3) two sets of documentary stamps. Note that successful examinees should PERSONALLY register and sign in the Roster of Registered Professionals.